The Parent Congress (fliers attached) is planned for Saturday, April 16th between 9 am and 2 pm at Universal Audenried CHS, located at 32nd & Tasker Streets. The purpose is to bring parents, families and community members (with children in various types of schools) together to get the resources and information needed to advocate for high quality schools in the neighborhoods where they live. Interactive workshops and panel discussions will help frame the conversation about crucial next steps. 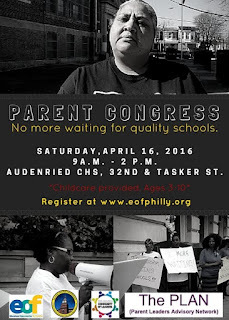 Food and childcare (for children between 3 and 10) will be provided for those who register at www.eofphilly.org Please share this flier with those who may be interested in attending. Thank you, in advance, for your anticipated cooperation. Enjoy your weekend!